18 Jun - True to his promise to film a martial arts-action movie after winning Best Actor at the Hong Kong Film Awards, Sean Lau has begun filming the new movie, "The Deadly Reclaim". As reported on Mingpao News, the actor, who attended the press conference announcing the new movie alongside co-star Louis Koo and Eddie Peng, stated that this is his first action movie after 20 years. 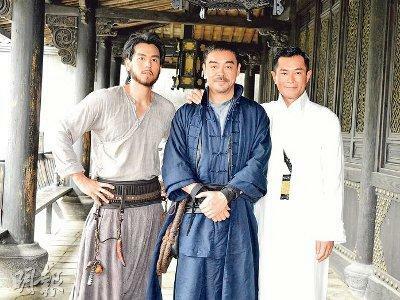 Playing the role as a guardian leader of the Pucheng village, Sean stated, "I haven't made an action film for a long time. But this time, working with Sammo Hung and other action film experts, how can I say no?" Sean admitted that he was ecstatic when he saw Sammo attaching wires to other actors. "It felt fresh. Sometimes I would come to set earlier than I was supposed to, so that I can witness the preparation," he said. Sean also revealed that he has been training to use a whip for his role, and joked that he would sometimes hit himself with it. When asked if he would transform himself into an action star through the film, Sean replied, "I started late, but I will try my best." Directed and produced by Benny Chan, the movie also stars Wu Jing, Liu Kai Chi, Philip Keung and Sammy Hung.